Save time and money by involving us early in your project! Request your free phone consultation today. Total Security Solutions produces the most comprehensive line of bulletproof barriers and products available. TSS plans, produces, and installs bulletproof barriers that are aesthetically pleasing and blend seamlessly with your work environment. Three decades of experience have made Total Security Solutions an industry leader in bullet resistant barrier systems, and the TSS team brings that expertise to bear on your security challenges. 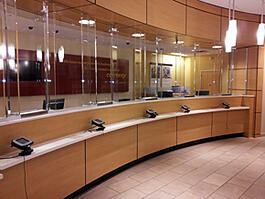 Total Security Solutions plans, produces, and installs bullet proof barriers that are aesthetically pleasing. We specialize in custom bullet resistant barriers, bandit barriers and bulletproof enclosures that fit the design of your work environment, including a variety of standard and custom bullet proof doors and bullet resistant windows.